I love baseball. Everything about it is fascinating to me. The mind games that occur at every moment of the game, the way every pitcher is different yet they do the same job, the amount of skill it takes to decide whether you are going to swing at an object hurdling towards you at nearly one hundred miles per hour. When I am bored at home I turn on MLB Network and just consume everything they are discussing. It hasn't always been this way though. Up until college I never paid much attention to sports. Sure, I played baseball, basketball, and hockey growing up but my heart was never in it. When I was a Freshman in college, something changed. I was headed out of my dormroom and on my way to the dining hall when the TV caught my eye. The Braves were playing (can't remember who) and the game was in extra innings. I sat down and watched the rest of the game. When I started watching I think they were in the eleventh inning. The game finished in the eighteenth or something crazy like that.eighteenth inning. That was when I knew that I could take an interest in sports. I tried watching football because that was the most popular sport in my group of friends but it never really grabbed my attention. Baseball is the only sport that truly matters to me. 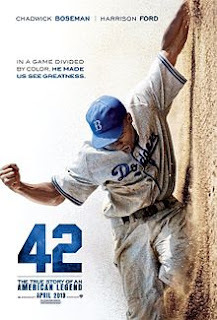 I say all this to set up my review of the Jackie Robinson biopic 42. I have always loved sports movies (Remember the Titans, Major League, Mighty Ducks, Tin Cup, etc) and I have added this one to my list of tops. What I want to do is go over my five favorite baseball movies and discuss why they hold a place in my heart. I promise that some of you will disagree (Bull Durham isn't on this list) but the great thing is it doesn't matter. 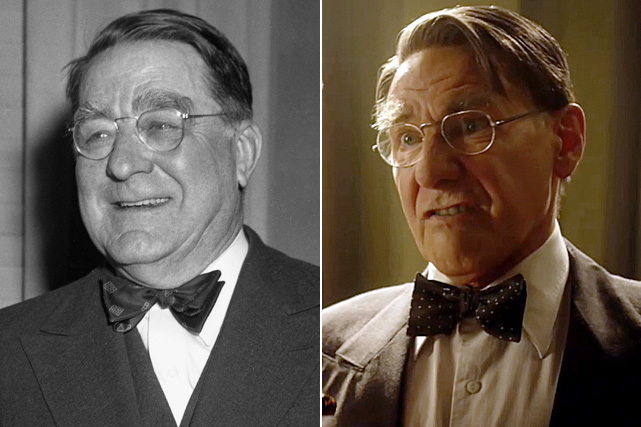 It is unreal how well the makeup crew did with him and Ford delivers a believable performance as the lovable curmudgeon. The writing of 42 couldn't have been an easy undertaking. There is a line that you must tow when it comes to race relations in film; you don't do enough and it looks like a weak attempt, however if you go overboard you will be lambasted as cashing in on the pain of the Black people. 42 does a great job of showing how people behaved in that time, Robinson's reaction, and the eventual acceptance of people of color in Major League Baseball. As I thought about this some more I am going to list five movies in ADDITION to 42. Again, my list will vary (I know Bull Durham is a favorite but I saw it too late in life to gain a proper appreciation). My number four film is Little Big League. This movie came out a year after Rookie of the Year and never gained the same attention, but I think it is a better film. Billy Heywood(Luke Edwards) is the grandson of the owner of the Minnesota Twins, Thomas Heywood. When Thomas dies, it is revealed that Billy has inherited the team. When he butts heads with the current manager of the team, Billy opts to fire him. He then appoints himself the manager of the team (while still being the owner). This wouldn't happen in real life but it's nice to dream! About :54 seconds in is great! Number three is Moneyball. This is where I'll lose some of you (if you haven't left already). Moneyball tells the story of the 2002 season of the Oakland Athletics. It shows Bill Beane's (Brad Pitt) skepticism and later acceptance of "buying" wins with overlooked players. Philip Seymour Hoffman does a great job as Art Howe as well. I really love this movie for several reasons. First, I love Brad Pitt. I would see a movie just because he is in it. I enjoy looking at baseball from a statistical side (SABR) and that's what this whole film is about. Above all, this film is shot beautifully. I get chills watching this. Number two is Major League. Not only is this a great baseball movie, but it is a great sports movie in general. Major League focuses on the lackluster Cleveland Indians who are in the thick of a streak of losing seasons. When the team is inherited by a reluctant owner, their future looks bleak. The new owner, Rachel Phelps, wants to move the team to a warmer climate and plans on sabotaging the current season so she can do so. Phelps tells her GM to hire a team of misfits and rejects, including an incarcerated pitcher, Rick "The Wild Thing" Vaughn (Charlie Sheen) and a catcher with knee problems, Jake Taylor (Tom Berenger). I love this movie because it is funny and it is a great underdog story! My number one favorite baseball movie of all time is...The Sandlot! If you haven't seen this movie then stop what you are doing and dedicate an hour and a half to watching it. You're life will be enriched because of it. The plot follows the summer of a group of boys in 1962. Scotty Smalls (Tom Guiry) has just moved to town and is clueless about the one thing the neighborhood boys love, baseball. As he struggles to find a place among the kids he learns about the sport as well as other things boys talk about, girls. When the ongoing game is threatened due to their ball being hit over the fence, Smalls comes to the rescue with a ball that he has seen in his step father's office. When that ball is lost over the fence, Smalls tells them there was a signature on the ball from some woman...Baby Ruth. The boys lunge at Smalls as they tell him that it is Babe Ruth, the Sultan of Swat! They then conceive several schemes to try and get the ball back. Ok, so I don't know where my head was at but Field of Dreams is my favorite baseball movie of all time! I was so wrapped up in everything I completely forgot. Kevin Costner stars as an Iowa farmer that hears a voice in his cornfield one day. It says to him: "if you build it, he will come". This phrase haunts him for days until he finally decides to level a section of his crops and build a baseball diamond. He travels across the country to recruit James Earl Jones and eventually goes back in time to meet a doctor that was once a great baseball prospect. Now, back to the original topic; 42. The film is very well done and I would recommend seeing it. Harrison Ford delivers one of his best performances of his career and the story of overcoming odds is appealing to everyone.